Orissa-based sand sculptor Sudarsan Patnaik has won the heart of visitors at the Sandsation International Sand Sculpture Festival in Berlin, Germany. The event was organised at Zitty Park located near the German parliament house at Berlin from June 13 to August 1. The 10 participants were from Germany, Russia, Holland, Denmark, Indonesia, Morocco, USA and India. The entries were displayed on an area spread over 8,000 square metres. There are two awards of which the winner of the German Sand Carving Award 2004 was Anique Kuizenga from Indonesia with her sculpture Modderve while the Artist's Trophy, which the participants award amongst themselves, went to Peter Busch Jensen for his sculpture Four Elements. "My sculpture was voted as the best by the visitors," Patnaik told rediff.com. His entry: a 25-feet high figure of Lord Hanuman. 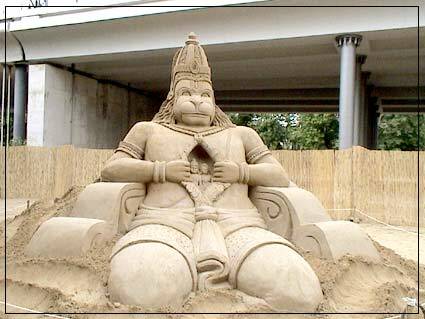 He has participated in 23 international sand sculpture festivals and won several prizes. In 2003, he had won the second prize at a competition in Spain and 4th prize at another event in China. It is great & we are proud of it.